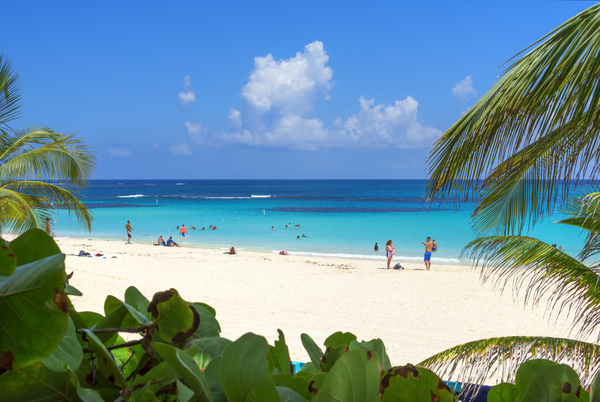 Puerto Rico is an Island in the Caribbean, which is adored by many beach lovers from across the world. The island offers hundreds of miles of white sandy beaches and crystal clear waters. With so many beautiful destinations, how can one choose? Here we explore a few of the top reasons for why you should consider Flamenco Beach on your next holiday. Flamenco Beach has repeatedly been voted as the best beach in Puerto Rico. As a matter of fact, it was considered to be the second most beautiful beach in the world by The Discovery Channel. Flamenco Beach is located in the region of Culebra, an island just east of the mainland of Puerto Rico. The island is centered between the eastern coast of Puerto Rico and just west of The US Virgin Islands. Flamenco Beach holds its reputation dearly, due to its jaw-dropping views and turquoise waters of the Carribean Sea. Flamenco beach is a family-friendly destination. The beach has calm safe waters with gentle waves and several shallow areas which are perfect for toddlers and all family members to enjoy. The beaches also have lifeguards on-duty, easy beach access, outdoor showers, kid-friendly bathrooms, and a crystal clear pools surrounded by views of the sea. Flamenco Beach is ideal for romantic getaways, as it provides several intimate spots for lovebirds. The island is also very spacious, which means, you can find a peaceful spot to chill and enjoy some alone time. Flamenco beach is a great place to enjoy outdoor and water activities. You can find an array of things to do such as swimming, snorkeling, boating, jet skiing, and sailing. The beaches here are filled with tropical colorful fish and small reefs. 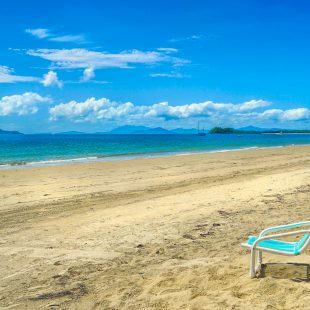 The area offers a serene environment due to its turquoise gentle waters and perfect landscapes covered with lush tropical plants, soft white sand, and green rolling hills. Fun Fact: The presence of old navy tanks at the beach also make Flamenco a tourist attraction site. 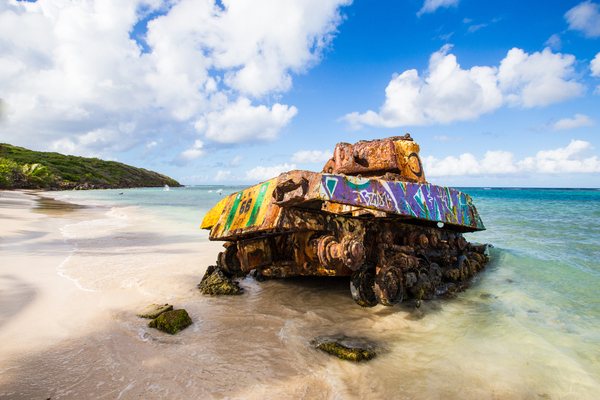 These tanks were left behind on the beaches of Culebra and are a unique and colorful feature of the island. There are several options for accommodations, including bed and breakfasts and hotels in Culebra. One will find a wide array of villas, beach houses, and Air B&B which range anywhere from $50-$300 USD per night. Fun Fact: If you are looking for a cheaper and more adventurous option, you can actually opt for camping right on the beach. No vacation is complete without trying the local foods. 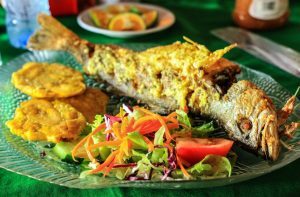 At Flamenco beach, you’ll find a wide variety of popular local dishes, including Tostones, fish platters, Surrullos, Alcapurrias, Empanillas, Pinchos skewers, and much more. There are several spectacular Caribbean style dishes included Conch salad and grilled octopus. For the less adventurous, you’ll still be able to find traditional American dishes such as pizzas and hamburgers. 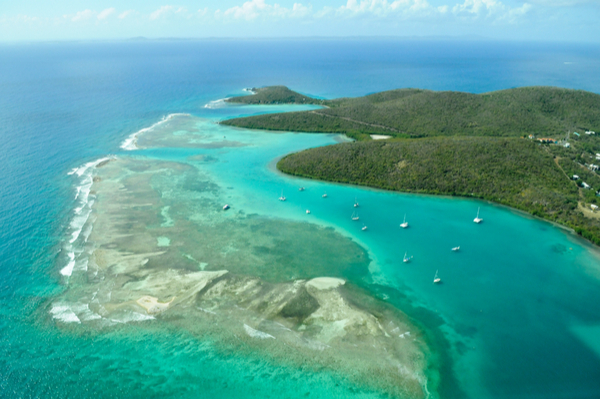 Exploring Flamenco beach in Culebra, Puerto Rico is like traveling within any part of the US. If you are an American, all you need is a driver’s license or another valid form of government photo ID. A US passport is only required for non-US residents. Air Flamenco offers direct flights from San Juan that take only 30 minutes round trip. Words alone cannot capture the magnificence of this island. You must consider a visit to this beach to understand why Flamenco Beach is voted the best beach in Puerto Rico.